This is for a Rustic Wood Garden Centerpiece Glass Cylinder Candle Lantern from Shopatusm. 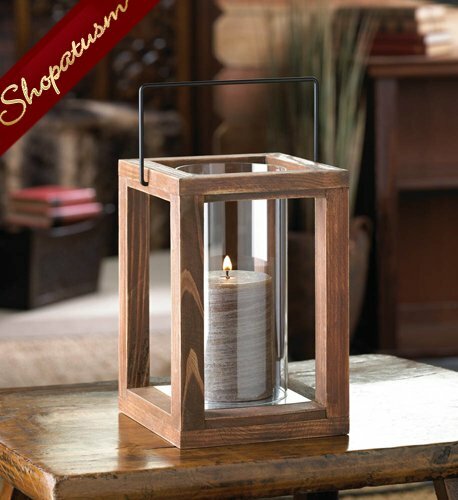 This rustic and stunning candle lantern features a wood frame that holds a tall golden glass cylinder inside. Place the candle of your choice inside the cylinder and enjoy the warm glow indoors or out. Item Weight: 1.8 lbs. 6 3/4 inch x 6 1/4 inch x 9 inch high; glass cylinder: 3 7/8 inch x 3 7/8 inch x 7 3/4 inch high. Wood, glass and iron. Candle not included.